This page includes links to all of our Tap related DIY how to projects. In this section you will find everything you need to know about taps including kitchen taps, bathroom taps, monoblock taps, how to repair a mixer taps, repairing leaking taps, supatap repair, how to install an outside tap and many other subjects. Browse through the below list and click on your chosen link to view the project information. Taps - dripping tap repair - Help and advice on how to repair a dripping tap. Description, explanation and parts diagrams on how to change tap washers, tap seals and the different types of washers and taps. Taps - fitting a monoblock tap - How to fit a monoblock mixer tap. Find out how to connect up or replace the monoblock mixer tap in your bathroom or kitchen. Your choice of tap can make such a difference to your bathroom design, or kitchen for that matter. Taps come with levers, and cross heads, they can be turned on with a sensor or by squeezing a trigger. They can be mixer taps or monoblock, modern or traditional taps, bath taps and shower head, we could go on! When you are choosing taps you should consider the style of the room you are choosing them for, do you want something sleek and contemporary or solid and traditional, and is that going to fit in with your sanitary ware? Taps and sinks need to be in harmony with each other not fitting against each other in terms of style and scale. For instance, if you are choosing taps for a cloakroom where you are likely to have a small sink you might be better with a small mixer tap and you certainly want to choose taps that are to scale with the sink. If you are choosing bathroom taps it is usually better to stick to taps in the same range, to make sure that your bathroom looks coordinated. Bath taps are bigger versions of basin taps, although you may want to choose mixer taps for one and single taps for the other depending on your preference. For safety you may choose thermostatic taps that regulate the temperature as you turn on the taps to avoid scalding. 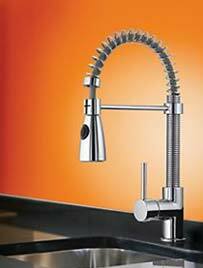 Kitchen taps are most often mixer taps these days, although they don’t have to be. If you have a Belfast sink you might prefer to go with taps that are more traditionally in-keeping with the look. Modern kitchen taps often double up as spray taps and they might even have a filtered water tap option as an integral part of the main tap. If you have taps leaking then you might need to know how to change a washer, or how to reseat a tap. Otherwise you may chose to go along the line of replacing a tap. We have video guides and tutorials as well as written project guides to help you with these DIY tasks, including how to repair and fit taps and wastes and other small plumbing jobs in this section. It is worth bearing in mind that our site is geared up for UK plumbing and tap sizing though if your have come to us from outside Britain. There are projects here on common problems with taps and some that are less common such as speedfit fittings, supatrap repair and ceramic disc taps. You might also consider fitting a filtered water tap or even a tap that delivers boiling water, so you can make tea at a moment’s notice.